A 1968 Ford GT40 Gulf/Mirage that was used as a camera car during filming of "Le Mans" will be the featured attraction at RM Auction's Monterey sale this August. Dressed in the famous Gulf Livery this car was raced extensively throughout 1968 before it was sold to Steve McQueen's production company Solar Productions in 1970. Once in the hands of Solar Productions this lightweight GT40—chassis P/1074—was used quite a bit as a camera car during the filming of "Le Mans". The company sold the car once filming was complete and it passed through the hands of several owners before being restored in 2003. A combination of factors—from the connection with McQueen to the GT40's iconic race history—will likely make purchasing this car in August an unthinkably expensive proposition. Driving that point home is the fact RM Auctions is revealing their pre-auction estimate by request only. 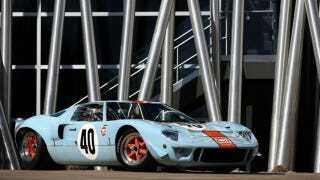 We know the car will sell for more than the $2.3-$2.7 pre-auction estimate on a 1967 Ford GT40 used as a promo car by Shelby American (last picture) that will also sell in Monterey but exactly how much is hard to say. We'd guess that well known saying about having to ask and being able to afford certainly applies here.